Vancouver is a city that loves its cocktails! Over the last 15 years, Vancouver's cocktail scene has grown exponentially, driven by both Vancouver's high-end food culture (our restaurants are among the best in the world) and by rising stars in bartending/mixology who have created world-renowned original cocktails. One example: David Wolowidnyk of West Restaurant created the "Passage to India" cocktail that was served at the Slumdog Millionaire Oscar party! The best cocktail bars are more than just delicious drinks; they also have to have a unique atmosphere, great location and feel exciting even when all you're ordering is tonic-and-lime. Part of Mark Brand's mini-empire of Gastown bars and restaurants--Brand also owns Boneta and Save-on-Meats--The Diamond is easily one of the coolest Vancouver cocktail bars. Located on the second floor of a historic Gastown building that was once a brothel and overlooking Gastown's landmark Maple Tree Square, The Diamond is sleek, urban and extremely stylish. Vancouver's Chinatown has recently seen an upsurge in hip nightlife spots, and that may partly be due to the longtime success of the Keefer Bar, where rock-star Vancouver bartender and Bar Manager Danielle Tatarin uses Chinatown-sourced ingredients to create one-of-a-kind Asian cocktails. Located across the street from The Diamond, the ultra-cool L'Abattoir is both one of the best restaurants in Gastown and one of the best Vancouver cocktail bars: sophisticated, chic and very stylish. It's also home to award-winning original cocktails that are among the best in the city. 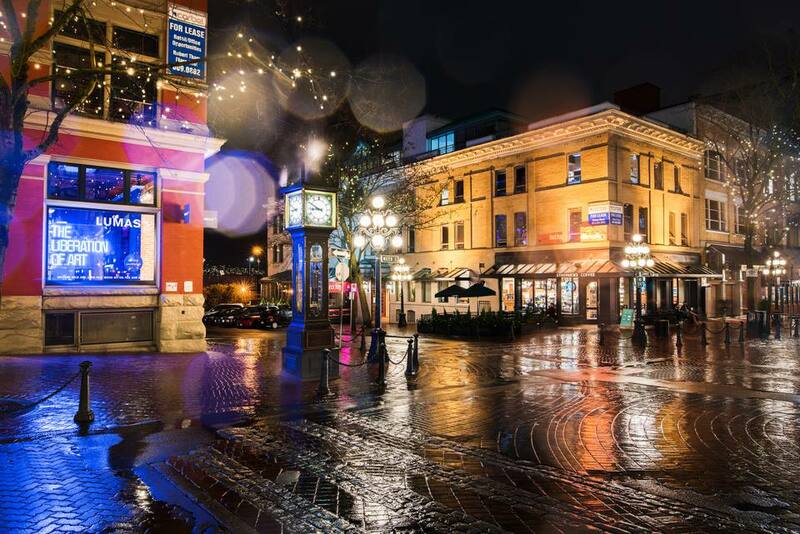 Yaletown--in particular Mainland Street and Hamilton Street--is the epicenter for upscale nightlife in Vancouver; restaurant/bars like ​Bar None and UVA Wine Bar (see below) are all see-and-be-seen hotspots. But the ultimate bar for celebrity-watching cocktails is the OPUS Bar at the OPUS hotel, where famous faces (and the occasional Canuck) are the norm and everyone looks fantastic, darling. Boasting an impressive array of beers as well as cocktails, the Cascade Room is a neighborhood bar that feels like it encapsulates the neighborhood itself: it has the same laid-back energy of Main Street/SoMa. Now more people-in-their-30s-and-40s-with-kids-who-used-to-be-hipster than hipster, the Cascade Room is a great spot for drinks with friends and one of the most relaxed Vancouver cocktail bars. One of Vancouver's top 5 restaurants with a view is also one of the best Vancouver cocktail bars: A revolving restaurant with 360-degree views, Cloud 9 is one of my favorite places to for after-dinner cocktails. Grab a window seat and enjoy incredible views in a swank, piano-bar atmosphere. Situated in the heart of the Granville Street nightlife district, The Refinery offers a huge range of original cocktails and is an ideal jumping-off spot for a night spent exploring Vancouver's best nightclubs (most of which are on Granville Street). Voted Best Wine Bar by the Georgia Straight every year from 2010 to 2015, Vancouver's UVA Wine Bar is a sophisticated alternative to the typical pick-up bar and one of Vancouver's go-to spots for getting drinks with friends or with someone special. Popular with a diverse crowd, it also made my list of Vancouver's best nightlife for people 40+. Sean Heather's flagship restaurant/bar is a neighborhood institution in Gastown. Unlike The Diamond or L'Abattoir, the Irish Heather is a throwback to old-fashioned, hard-drinking pubs--whiskey-lovers should check out the on-site Whiskey Shebeen for the largest selection of whiskeys in Vancouver. Though it's more of a bar-bar than a cocktail bar, the Irish Heather makes this list of top Vancouver cocktail bars for being one of the best places to grab a drink in the city, period. Of all the Vancouver cocktail bars, none is more high-society than the gorgeous outdoor Reflections Lounge at the historic Rosewood Hotel Georgia. Described as "swishy" by The Globe and Mail, Reflections is as luxe as Vancouver gets. Open seasonally in spring and summer; closed in fall and winter.